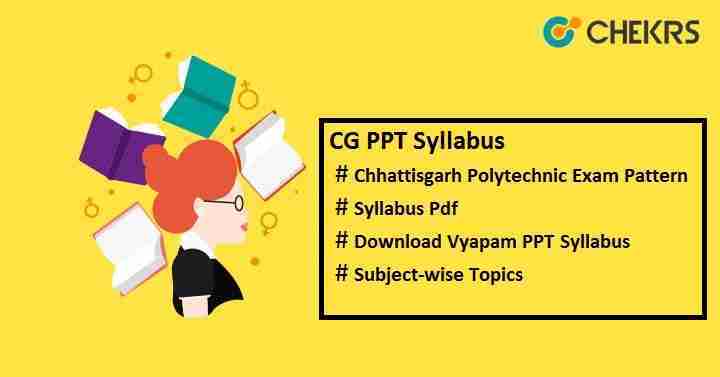 CG PPT Syllabus 2019: Candidates who are interested to take admission in government or private polytechnic institute of Chhattisgarh state various polytechnic courses can apply for CG PPT. CG PPT stands for Chhattisgarh Pre-Polytechnic Test. If you are aiming to appear in this exam and looking for exam syllabus, then you are at right place. Here we have provided exam syllabus along with the Chhattisgarh Polytechnic Exam Pattern for you so that you can take help of syllabus and start your exam preparation. CPEB (Chhattisgarh Professional Examination Board) will release the syllabus officially on its official website. Candidates who want to know the official CG PPT Syllabus 2019 Pdf can Check Here. It is very important to know the exam syllabus along as well as exam pattern because it will guide you what to study, which topics are more important and of how many marks. CG PPT Exam pattern will be decided by the examination controller of CPEB. The paper pattern is same as previous year. There is no modification in exam pattern, so here we have shared the Chhattisgarh Polytechnic 2019 Exam Pattern. The syllabus will be of class 10 level. We suggest you to focus on the NCERT 10 syllabus to score good marks in the polytechnic entrance exam. You can also take help of CG PPT Previous Year Papers to get exact idea of original question papers. Start preparing from today and try to give online mock test on a daily basis after completing the exam syllabus. For any sort of query, you can drop your question in the Comment section below. We will reply you soon. Keep visiting this site to get latest updates. All the Best!! !